Share Your Sci offers training and custom science communication support. Some services are offered online. 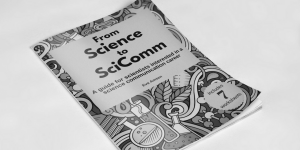 For researchers and scientific organisations in the UK, in-person scicomm support is available. Writing and consultation are offered by Dr Eva Amsen. She is the founder of Share Your Sci and has over a decade of experience in science communication and writing. See her portfolio and CV. Contact Share Your Sci to arrange a science communication workshop for your department or conference. Possible topics include: Blogs and social media for scientists, the reach of open science beyond academia, science communication careers. Location: In-person visits are available within reasonable travel distance from London (UK) if travel costs are covered in addition to the workshop fee. No additional travel costs charged within London zone 1-3. If you need personalised scicomm support for one of your projects, please contact us to see what we can do for you. Science writing. Rates for science writing jobs vary because they are dependent on the amount of work and the type of project. Email to discuss your budget and needs. The type of writing we can do for scientists: General summary of your project in a few paragraphs or sentences, conference summaries, press release text (no distribution), text for crowdfunding or citizen science projects, summaries of papers aimed at people outside of your field, content for websites or newsletters, video scripts, flyers, etc. Get in touch to find out how we can help you with your specific requirements. Science communication consultation. If you’re not sure what kind of science communication help you need, we can help you get started with a 20-minute online conference call. How it works: Email us so that we can arrange a good time for an online call that suits our respective time zones. Once we’ve scheduled a time for the call, we’ll send you an invoice and some questions about the project you need help with. During the call, we can narrow down your requirements, and advise you on the best next steps forward for your project. This call has a fixed price of £25 (GBP), €30 (EUR) or $35 (USD). If you need further support after that, you will be charged separately.